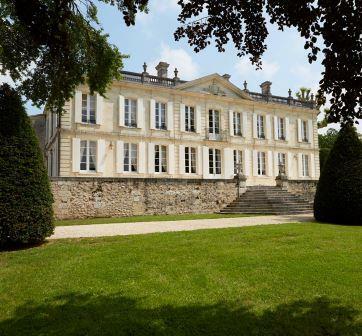 While the modern era of Chateau La Dauphine is quite recent, the estate is one of the older properties in the region dating back to the late 1600’s. The beautiful French chateau was built in 1750. The property was owned at the time by Louis Dauphin, which is where the estate takes its name from. In 1985, the vineyard was purchased by the Moueix family from François Regis Marcetteau de Brem, a direct descendant of the original owner. They did not own the property very long, as they sold it to Guillaume Halley in 2001. 3 other vineyards were included in the same transaction with the Moueix family, La Croix Canon, Canon de Brem. Guillaume Halley earned his fortune as the owner of the Champion supermarket chain. The Halley family are the founders of the massive supermarket chain, Carrefour. Under Guillaume Halley, Chateau de La Dauphine was completely transformed into a modern, chateau and vineyard in the region of Fronsac. In fact, he spent close to ten million Euros for the renovations! With that budget, Chateau de La Dauphine, with its renovated chateau, new chai and modern wine making facilities that are completely gravity fed, was turned into a contender for the top wine of the Fronsac appellation. His son Jean Halley took over the estate, hiring Michel Rolland as his consultant in 2012, replacing Denis Dubourdieu. To increase the quantity of Chateau de La Dauphine, Jean Halley was able to merge Chateau Canon de Brem into La Dauphine. That was quite a feat considering that Canon de Brem was located in the Canon Fronsac appellation. In December 2015, it was announced that Guillaume Halley sold Chateau La Dauphine to the Labrune family, through their personal holding company, FCB SA. The is the first Bordeaux wine investment for FCB SA, which until now, focused on technology and the healthcare sector. The new owners received approval for organic and biodynamic certification starting with the 2015 vintage. In 2016, the Labrune family added to their holdings in Fronsac when they purchased Chateau Haut-Ballet from Olivier Decelle. Those vines were incorporated into the vineyards of La Dauphine vineyards. The 53 hectare vineyard of Chateau de La Dauphine is planted to 80% Merlot and 20% Cabernet Franc. Located on the top of the Fronsac plateau, they have an elevation of 60 meters, making them one of the highest points in the appellation. The terroir is clay, limestone and sand soils on the plateau. At the bottom of the slopes, you find more sand, silt and clay in the soils. The vineyard is planted to a vine density of 6,300 vines per hectare. On average the vines are 33 years of age. Starting in 2012, Chateau La Dauphine shifted to 100% organic farming techniques. They earned their certification for organic farming in 2015. They are also experimenting with biodynamic farming on a 3 hectare parcel of vines. The plan is to continue increasing the number of hectares that are managed using biodynamic farming techniques. 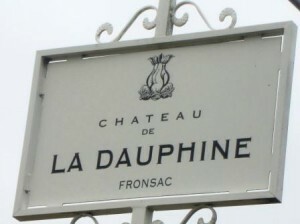 The wine of Chateau de La Dauphine is made in a completely modern, state of the art facility in the Fronsac appellation. In fact, it currently offers the most advanced wine making facilities in the entire commune as well as in much of the Right Bank! The semi underground, circular vat room has 26 concrete vats that are placed around the sides of the building. This is in addition to the 16 stainless steel tanks for that are also used for the vinification. Each of the tanks are 50 hectoliters in size, allowing for the parcels to be vinified on a plot by plot basis. Malolactic fermentation takes place in French oak barrel. 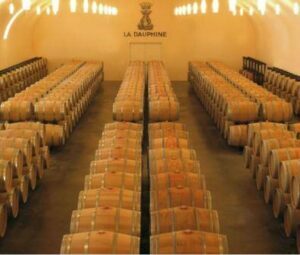 On average, the wine of Chateau de La Dauphine is aged in 30% new, French barrels oak for 12 months. The average annual production of Chateau de La Dauphine is close to 6,500 cases of wine per year. There are two second wines, Delphis de la Dauphine and Les Cyprus de la Dauphine. Chateau La Dauphine is much better with at least 2-4 years of aging in good vintages. Young vintages can be decanted for 1 hour to 90 minutes. This allows the wine to soften and open its perfume. Older vintages might need very little decanting, just enough to remove the sediment. Chateau La Dauphine offers its best drinking and should reach peak maturity between 3-12 years of age after the vintage. Chateau La Dauphine is best served at 15.5 degrees Celsius, 60 degrees Fahrenheit. The cool, almost cellar temperature gives the wine more freshness and lift. Chateau La Dauphine is best paired with all types of classic meat dishes, veal, pork, beef, lamb, duck, game, roast chicken, roasted, braised and grilled dishes. Chateau La Dauphine is also good when matched with Asian dishes, rich fish courses like tuna, mushrooms and pasta. Chateau de La Dauphine is a top value Bordeaux wine and one of the best wines from Fronsac Canon Fronsac. It’s filled with lusty, ripe, dark, jammy fruit, soft textures and good concentration. Plus, the wine of Chateau La Dauphine drinks well young. Chateau La Dauphine has embraced luxury wine travel. There is a restaurant on the property that is a great spot to enjoy views of their vineyards, while dining al fresco. With deep color, this fruity wine is on the dark berry side with plenty of fresh, juicy blackberries and plums adding to the fun. Lushly textured, sweet and fleshy, the wine has a ripe, plump personality. With deep color, you catch the floral, blackberry, licorice and vanilla nose first. The lush textures, freshness and juicy fruits in the finish make this wine already delicious, and it should age for a few years too. Deep in color, the wine is lush, rich, fleshy, sweet and long. There is minerality, loads of ripe, juicy fruits, length and character. You can drink this for pleasure for at least 15 years or so. Sensuous textures, forward, lush dark fruits, licorice, cocoa and earth for an affordable price. What’s not to like? Licorice, black cherry, red plums, espresso bean and earth make up the perfume. Medium bodied, with round textures and an accessible personality, this will drink best at a young age. Coffee, earth, cassis aromas open up this early drinking crowd pleaser that ends with flavors of kirsch and plums. Soft, lush and plush, this licorice, coffee, vanilla and dark cherry filled wine is a bit on the oaky side. Drink this young as it's not going to develop much more complexity. Licorice, chocolate, black raspberry and black cherry aromas lead the way to a a rich, ripe, concentrated wine filled with gobs of lush dark berries, black cherries and fennel. From one of the best producers in Fronsac, this bargain priced Bordeaux wine made from a blend of 80% Merlot & 20% Cabernet Franc delivers a lot of bang for the buck. Personally, I prefer wines like this on young side. I'd drink it before its 10th birthday.